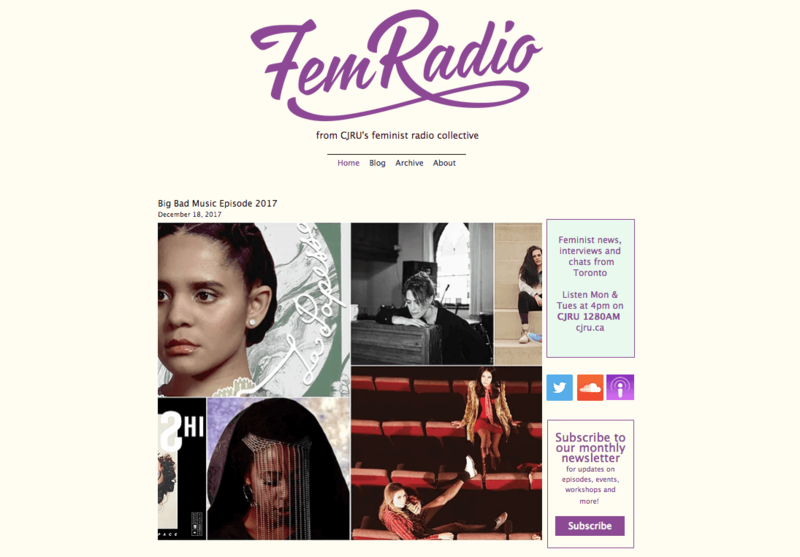 Founded in 2016, FemRadio is a weekly feminist radio show based in Toronto, Canada. Hosted and produced by CJRU staff and volunteers, FemRadio aims to tell stories of rad women making a difference in our community. As a founding member of FemRadio, Stacey Copeland took on a role as a lead producer and host. She has interviewed notable musicians, comedians, artists and scholars. Past interviews include Peaches, Lido Pimienta, Jess Beaulieu, Marusya Bociurkiw, Cait McKinney, Cécile Doo-Kingué, Drunk Feminist Films, and Venus Fest Founder Aerin Fogel among many others. FemRadio is a production of CJRU’s Feminist Radio Collective. Our goal is to get more women’s voices on the air and more women’s hands making radio. We particularly support voices of women of colour, indigenous women, women with disabilities, and LGBTQ+ folks. The collective has won numerous national awards from the NCRA/ANREC including the “Women’s Hands and Voices” award in 2016 and an honorable mention for Copeland’s Witchcraft mini-series in 2017.